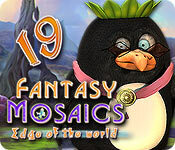 Fantasy Mosaics 19: Edge of the World is rated 3.8 out of 5 by 12. Rated 5 out of 5 by mamacat2many from Challenging I am hooked on this games played them all gold star winner can't wait for 20 to come out. Rated 5 out of 5 by trixie7533 from Not that easy I really love this series and I hope it isnt finished though I have a lot to catch up on as I started doing these later than most. They are the best nonogram puzzles on here but maybe its my age ..........lol. I am 63! I don't usually buy games without trying them first but just had to buy this and hope there are many more to come. The idea of different shape grids sounds a good idea too as long as they don't make them more complicated ! Rated 5 out of 5 by pennmom36 from They're On The Edge Of Glory, And They're Bringing Us Some Beautiful Puzzles Those Penguin's are alway's on the go, but this time, they managed to make it to the Edge of the World! Hopefully this doesn't mean the end of their family adventures! 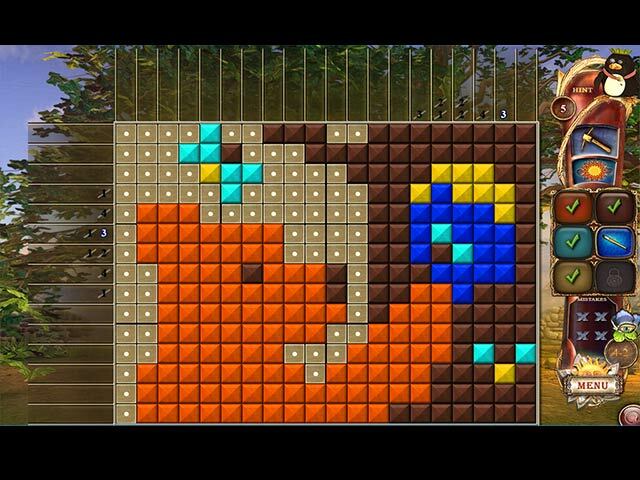 As with all Fantasy Mosaic games, every step you take in this puzzle helps the penguins discover unusual items for their garden. This latest version still has 6 different color bubbles, but they have added several new colors in the last two games, including fluorescent colors. You can switch between the color bubbles to help you solve these colorful griddlers, and you can earn a Gold trophy if you make no mistakes, a Silver trophy if you make one mistake and a Bronze trophy if you make two mistakes, three mistakes require you to replay the level. You will also earn up to three gold Stars if you don't use any hints, one star is deducted each time you use a hint. Therefore, it is possible to make a mistake or two but still earn 3 stars if you don't use any hints. This is a griddler or mosaic type puzzle game where you fill in and cross of cells on various sized grids, using logic, so you'll never have to guess. There are groups of numbers located on each column and row of the grid, each group of numbers must be separated by at least one blank or crossed off cell. Sometimes it's easier to figure out where numbers can't possibly fit to reduce the amount of cells and narrow the playing field down a bit. Some cells contain bonuses such as extra hints, extra mistakes allowed or an extra pickaxe which allows you to choose which cell you want a hint on. There is a Sun icon as well that when fully charged, will give you a mega hint, filling in or crossing off a 3x3 area of your choice. 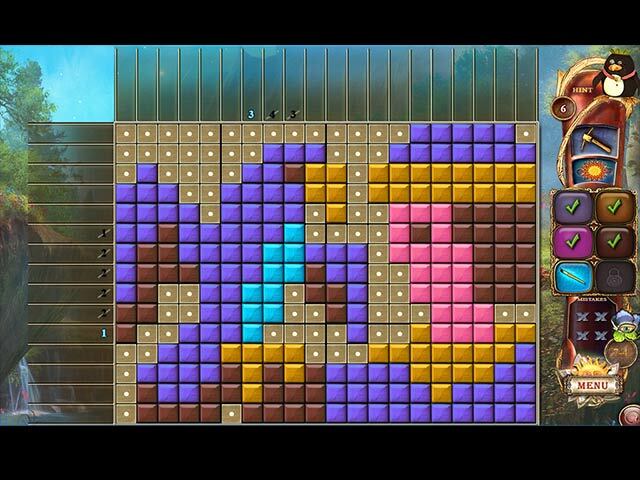 The one feature that makes Fantasy Mosaics stand out from the rest of the griddler games, is the vibrant array of colors available, and now there's six different colors used to make the pictures even better. It can also help you solve the puzzle when you get stuck, because you can switch to another color which ultimately narrows down the available cells. Unlike many griddler games, these pictures actually make sense, because they have six different colors you know what image you have created. This is my favorite Mosaic Griddler series and is one of the best available, and certainly the most colorful. This is a must have game for griddler geeks and an immediate purchase for this geek, enjoy! Rated 5 out of 5 by sunnyglow from THE PENGUINS HAVE RETURNED WITH OVER-THE-EDGE NEW PUZZLES OVERVIEW: What a wonderful Monday surprise! I am on the edge of my seat anxiously awaiting to play this 5-star puzzle game. The adorable Penguin family have returned from the edge of the world, giving the customers at BFG the edge on their new griddler game. A BIG THANK you to BFG for offering a game in one of my favorite genres. I LOVE these games and this developer is on the cutting edge in producing innovative and creative griddlers. . This is another excellent game from Match Gems. I have played every one in the series and this game is designed exactly like the others. This puzzle has many different names (AKA O’Ekaki, Griddlers, Paint-by-Numbers, Pic-a-Pix, Nonograms or whatever you call them); however, no matter the name, they are a fun puzzle game. HOW TO PLAY: This is variety of a Sudoku puzzle. In this puzzle, create pictures by filling in squares in a grid. The grids in this game will vary in size. Each side of the grid will have numbers for each line of squares indicating the number of squares which are to be filled in for that row of squares. Squares are filled in where the squares intersect between the two sets of numbers on each side. GAME FACTS: • Levels: Casual and Advanced. • Colors: The game has up to six colored screens which can be switched at any time while playing the puzzle. • Autofill: There is autofill so you do not have to fill in the unused boxes. However, you can use your mouse to right click “X’s” for unused spaces. • Hints: Hints are given as you proceed and are based on the difficulty of the puzzle and how well you perform in solving the grid • Number of Levels and Puzzles: There are 100 puzzles – 20 levels with 5 puzzles per level in the game. • Aids: You have a pickax as an aid in the game • Awards: There are 3 trophies: a gold trophy for no mistakes, a silver trophy for 1 mistake, and a bronze trophy for two mistakes. If you make 3 mistakes, you must start the game over again. • Collectibles. When you complete one level of 5 puzzles, you receive an item to place in your garden. • There is an eye on the bottom right of the screen. When pressed, it allows you to see the figure being worked on without the unfilled squares. I highly recommend this game if you like Sudoku games or any type of mathematical puzzle. Rated 4 out of 5 by SrRat from LOVE THOSE PENGUINS!! I love the Fantasy Series and I have all of them. I love the penguins, love the music, the backgrounds, the themes; but... Yeah, there's a 'but' coming. The picure puzzles in FM 19 are a bit simplistic. I go back and replay all of the games - I enjoy them so much. I've been replaying FM 17. The puzzles are beautiful and complex, showing Imagination. I am missing that touch of imagination in 19 - sadly. I still purchased it because of the other elements of the game. But if you are expecting this to be a step up from 18, you may be disappointed. So I recommend this game with reservations. Rated 4 out of 5 by auntbeth from fun/needs bigger grids i love the series. I started playing world mosaics when they first came out, but this is even better. However we really need bigger grids! I can do 25*25 in world, and after 19 games in fantasy we are still at 20*20. Maybe make it an option, or something. I would love 30*30! Rated 4 out of 5 by FlashyFisher from Best mosaic in series! I really loved mosaic games, I think this episode is the best in series. Cant wait for the next episode with some new challenging level design. Rated 4 out of 5 by LogieBaby from Have I reached a saturation point ?? 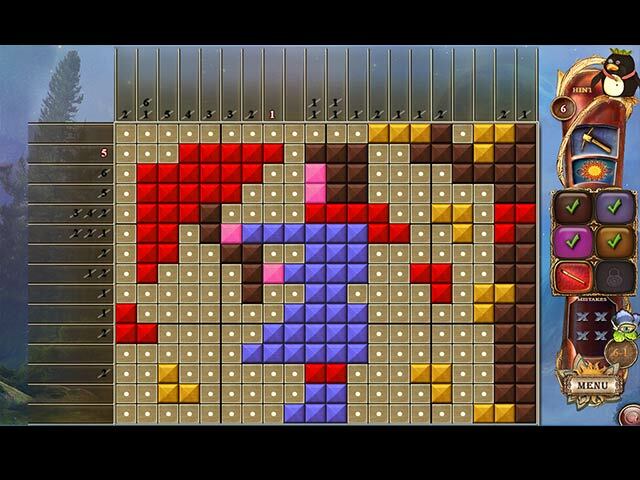 I will never knock the terrific grid puzzles that Match Gems games this developer puts out. These renditions with the penguin family are the very best of the griddlers. These are the only games where the finished product looks like what the title of each grid implies. Using 4 to 6 colors in each grid and having such a variety of colors is fantastic. For me the problem and it is a minor one is that I am getting tired of seeing cats, owls, friends, etc. in every new chapter of the series. While I can understand that Match Gems keeps churning these games out at such a rapid pace, I would too because the money is certainly rolling in, I wish either we get to see entirely new grids or better yet have various shapes ( ovals, squares, triangles, etc. ) that another grid maker gave us a few months ago. The problem with the earlier shape game is too many glitches that were never patched. I suppose I might use a free game code if a code is at its expiration date and it's either use it or lose it. I won't buy it. One last thing, these games are not Sudokus as in intimated elsewhere. Sudokus always use the numbers 1 through 9 in various combinations. This is a wonderful game and for those who can't get enough of them grab it and growl.